In air conditioning large buildings and in some industrial processes, chillers make cold water for cooling. 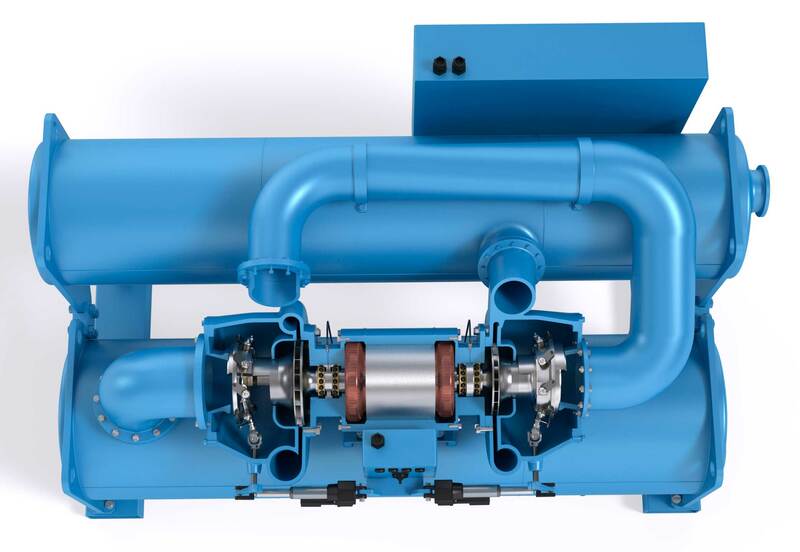 In large chillers, centrifugal compressors are used in the refrigeration cycle. 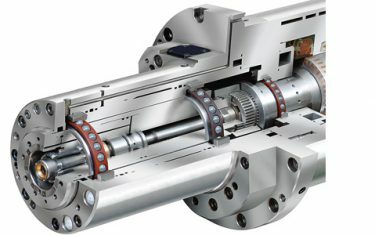 Traditionally, oil-lubricated hydrodynamic bearings support the compressor shaft. Now, SKF has developed a series of rolling bearings that can use the refrigerant for lubrication. 1. 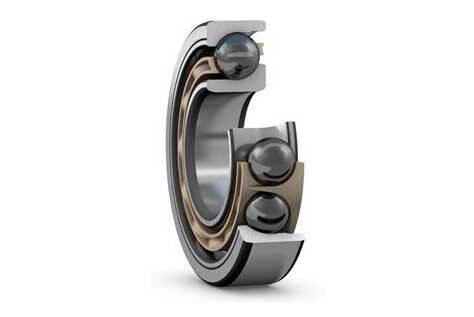 Over the years SKF has developed a solution for PRL rolling bearings that is available for use in refrigerant-lubricated environments such as oil-free compressors. 2. The solution has been achieved via a careful selection of materials, design and quality, together with laboratory experimentation and testing. 3. As new refrigerants are introduced on the market, SKF investigates their characteristics and impact on bearing tribology and adopts PRL technology for an efficient implementation in compressor applications. 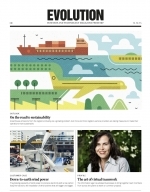 Researchers at the SKF Engin-eering and Research Centre carried out investigations in the 1990s to test the dilution of lubricant oils with refrigerants and the consequences in bearing performance and life. In refrigerant compressors, it is difficult to avoid dilution of the oil by the refrigerant, and it is important to understand how the dilution affects rolling bearing performance. It was found that conventional all-steel bearings started to exhibit signs of inadequate lubrication at dilution levels of 20 % to 30 %. This led to the investigation of alternative bearing designs and materials to improve bearing operation and life under these poor-lubricant conditions. The studies showed that it was difficult to find a limiting dilution ratio for hybrid bearings that have steel rings and ceramic balls made of bearing grade silicon nitride (Si3N4). Finally, in 1996, hybrid bearings were run in pure refrigerant with no traces of oil, and it was found that following the feasibility test, the bearings were in as-new condition. This was a critical test result – one that opened up the possibility of using refrigerant as a lubricant for special rolling bearings. Since then, research and application development have continued and have led to several additional product features enabling reliable long-term operation. Fig. 1: Centrifugal compressor chiller with two rotating impellers. In analytical studies that followed, it was found that refrigerants could actually form an elastohydrodynamic lubricant film. This is possible because refrigerants, like oils, increase their viscosity under the very high pressure developed in the contact areas between the rolling elements and the bearing raceways. The increase is not as significant as with lubricating oils, but it is sufficient to produce a very thin lubricant film. In conventional all-steel bearings, this thin film would be inadequate for lubrication, but the ceramic/steel material combination and other features of the newly developed hybrid bearings enable reliable operation with this very thin film of refrigerant. Previously, it was not thought possible to use refrigerants as lubricants because of the very low viscosity. The development of specialized rolling bearings able to perform properly using only refrigerant as lubricant is termed “pure refrigerant lubrication” (PRL) technology for rolling bearings. PRL is a specific part of a wider SKF programme that covers ultra-low viscosity fluids (ULVF) used to lubricate rolling bearings (e.g., fuels, water, rocket fuels or liquefied gases). SKF is the owner of several patents involved with PRL and ULVF. Fig. 2: Rolling bearing arrangement for a centrifugal compressor chiller with two rotating impellers. One application area for refrigerant-lubricated bearings is compressor chillers  used in large air conditioning systems and industrial processes. Chillers use refrigerant in a vapour-compression cycle to cool water, which is then used as a cooling medium in an industrial process, or to provide air conditioning in a building. Large capacity chillers, above 300 tons of refrigeration, (ton of refrigeration, TR), are typically equipped with centrifugal compressors. Normally, there is a single compressor for each chiller. Centrifugal compressors have one or more rotating impellers (fig. 1). The speed of rotation of the impeller is determined by the required impeller peripheral speed and depends on compressor size, capacity and type of refrigerant used. Compressors using low-pressure refrigerants rotate at lower speeds than compressors using medium- or high-pressure refrigerants. Even with oil lubrication, the operating conditions of the bearings in compressors present difficult lubrication problems, due to the presence of refrigerants. 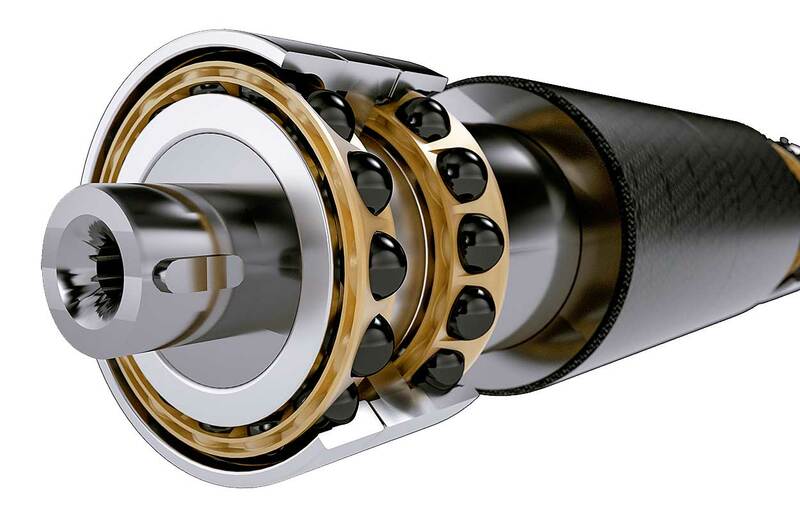 The bearings of the impeller shaft are critical to compressor performance and efficiency. Traditional compressor designs have hydrodynamic bearings that use large amounts of circulating oil for lubrication and have systems to separate out the oil mixed with the refrigerant so that the oil can be used as a bearing lubricant. Since refrigerants are typically very good solvents, it is difficult to avoid dilution of the oil by the refrigerant. Oil-lubricated rolling bearings require less flow of oil and have a lower frictional moment, but they also need separation systems to reduce the dilution of refrigerant in the oil. Therefore, the use of PRL technology in this case is very attractive  (figs. 1 and 2). Oil-free operation also has other advantages: There is no need for oil maintenance, no need to dispense used oil, no risk of oil collecting in the evaporator, no need of a heater, and for air-cooled chillers, no risk of contamination of soil in the event of pipe breakage. Fig. 3: Contact set-up for film thickness measurement in the SKF WAM-5 tribometer. Understanding to what extent a refrigerant can form a lubricating film in a heavily loaded rolling contact, as oil does, has been a crucial development in PRL technology. Rolling bearings are lubricated by means of the elastohydrodynamic lubrication (EHL) mechanism . 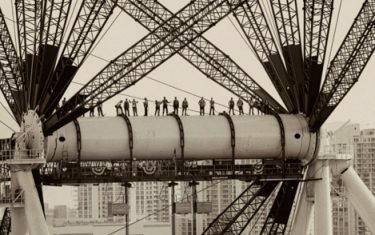 In other words, since rolling bearings rely on heavily loaded contacts, the lubricant shows an increase of viscosity with rising pressure, at the same time that elastic deformation of the steel bodies takes place to accommodate the lubricant. 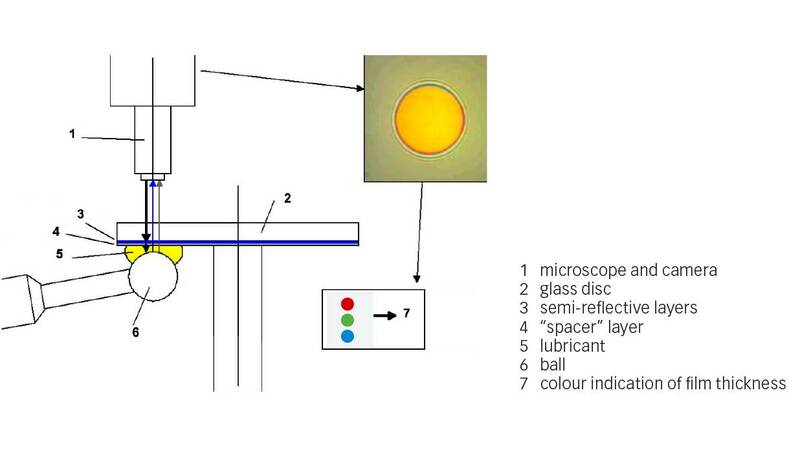 These two mechanisms are responsible for the build-up of a thin lubricating film of one to a few microns thick in EHL conditions that is able to separate the contacting bodies in a normal oil-lubricated situation. However, until recently it was unknown whether or not some of the refrigerants used have this property of piezo-viscosity (increase of viscosity with pressure) and how much the roughness of the bodies and its elastic deformation will affect the separation. It is difficult to study refrigerants in “liquid” conditions under high pressure as is typical of EHL contacts (one or more GPa pressure). However, nowadays studies and measurements of lubricating properties of typical chiller refrigerants are emerging [4, 5, 6]. Properties such as viscosity, piezo-viscosity, compressibility, shear stress and boundary friction are important to understand the behaviour of a refrigerant in an EHL contact. Film-thickness measurements with refrigerant R1233zd have been carried out at SKF  using the interferometry technique of the SKF WAM-5 tribometer (fig. 3). With this set-up it has been proven that indeed lubricant film thickness can be formed with this refrigerant (fig. 4). In cooperation with SKF, INSA de Lyon (France)  has also carried out film-thickness measurements in a home-made ball-on-disc tribometer (different geometry from WAM-5) for the refrigerant HCFC-123, also showing that this refrigerant forms a lubricating film (fig. 5). 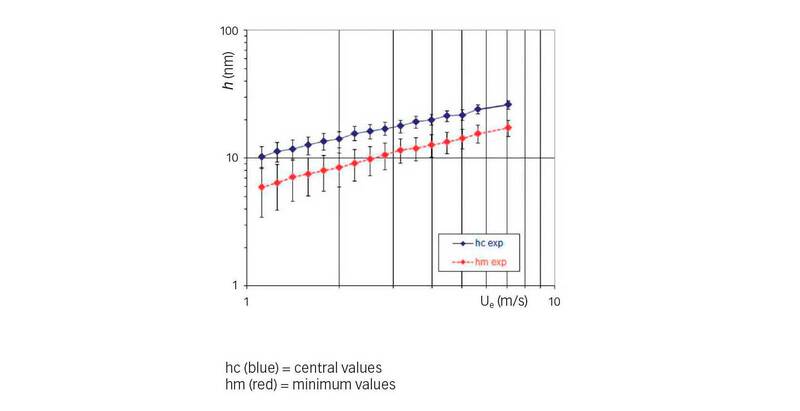 Once the lubricating properties of the refrigerants are known [6, 7], these can be introduced in simple regression models or sophisticated numerical models for film-thickness calculations like any other EHL contact (fig. 6). Fig. 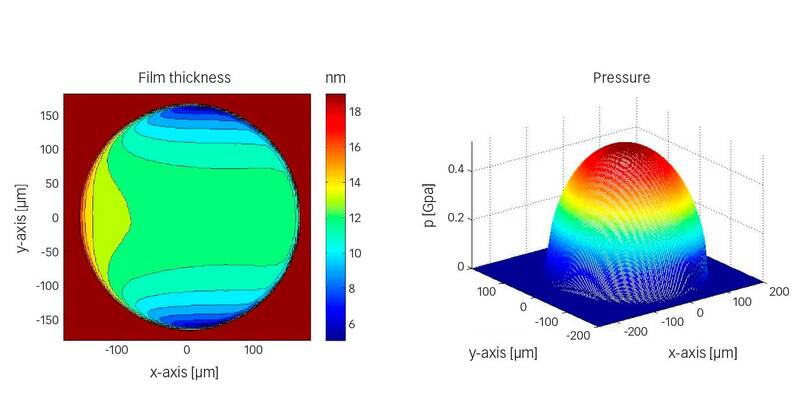 6: Example of a numerical film thickness and pressure calculation for the ball-disc configuration of fig. 3 for refrigerant HCFC-123 with an entrainment speed of 2 m/s. In poor lubrication conditions, hybrid bearings (steel rings and Si3N4 rolling elements) have several advantages compared with all-steel bearings , mainly due to the intrinsically lower boundary friction coefficient and the fact that those two dissimilar mater-ials do not weld at high frictional temperatures, as opposed to steel-steel contacts. 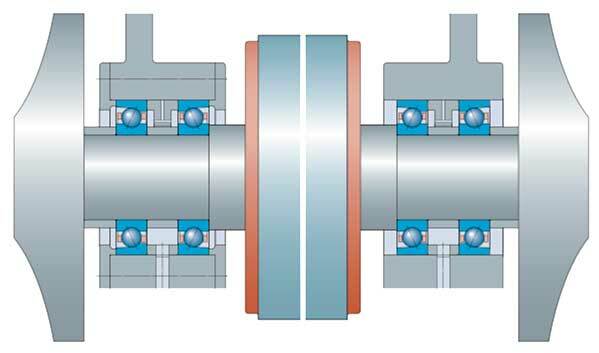 Therefore, from the beginning SKF has pursued this bearing configuration for PRL conditions . As an example of the success of hybrid contacts in PRL conditions, published references  show results of measured boundary friction for a hybrid contact (Si3N4 ball and a steel disc made of through-hardened stainless nitrogen steel according to SKF specification VC444). The results are summarized in fig. 7. From fig. 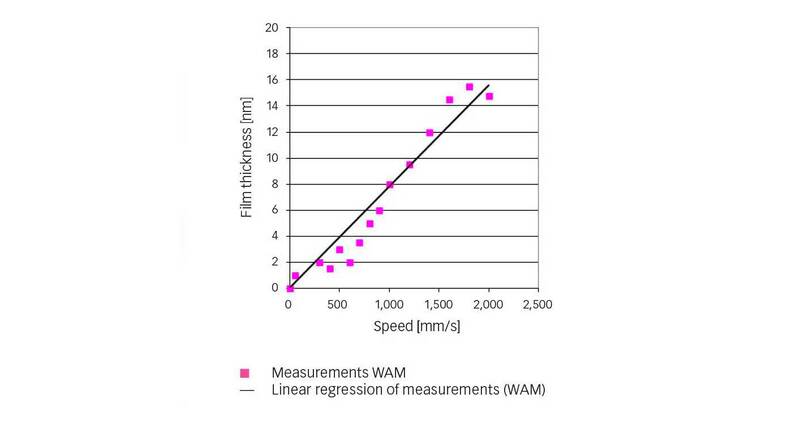 7 (left) it can be observed that the boundary friction coefficient in the Stribeck curve is only 0.07; this value is very low in comparison with typical oils and steel-steel contacts (up to 0.15). Fig. 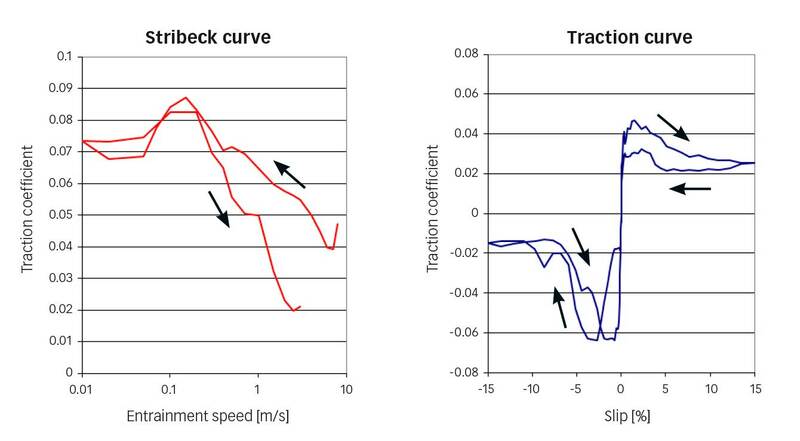 7: Stribeck curve (left) and traction curve (right) for refrigerant R1233zd, ceramic ball and through-hardened stainless nitrogen steel according to SKF specification VC444 (p=0.94 GPa). The arrows show entrainment speed (left) and slip up and down (right). A bearing solution for centrifugal chillers that is reliable in PRL conditions has resulted from the various SKF in-house tests, laboratory experiments and simulations . (3) a cage made of fibre-reinforced PEEK material. All this is assisted by expert application engineering to define bearing arrangements, lubrication methods, filtration degree, preload and tolerances. Fig. 8: Hybrid angular contact ball bearing for extreme applications (inner and outer rings to SKF specification VC444, ceramic balls, fibre-reinforced PEEK cage). The first field trial with compressors incorporating the PRL technology used in oil-free air conditioning chillers was commissioned in the early 2000s; the chillers worked well and are still in operation today. A leading air conditioning company launched chillers with PRL compressors in the market in 2002. At first, there was a lot of enthusiasm about the elimination of oil and the advantages offered by PRL, but interest from customers soon faded. As it turned out, the reason was an interesting phenomenon that sometimes can be seen in product development and marketing. 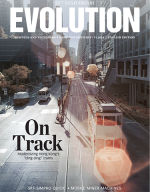 There was less demand because there was no competition to PRL technology. The situation changed when (Danfoss) Turbocor launched its centrifugal compressor that had magnetic bearings and did not use oil. 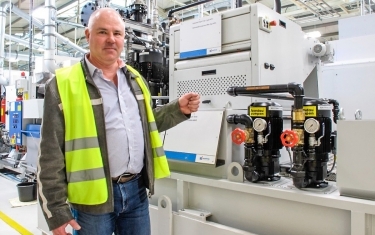 Soon other compressor manufacturers developed compressors with magnetic bearings, and then there was a renewed interest in PRL as an alternative oil-free solution. Development of PRL compressors resumed and the compressors were launched on the market. Today, there is a lot of interest in PRL technology globally. Along with compressor development by compressor manufacturers, SKF has intensified research and development of PRL technology, both in tribology scientific research and in bearing application technology development. Fig. 9: 3D view of bearing arrangement. Wallin, H.H., Morales-Espejel, G.E., “Hybrid Bearings in Oil-Free Air Conditioning and Refrigeration Compressors” SKF Evolution, No. 2 2002, pp. 28-30. Pandy, D.R., Brondum, D., “Innovative, Small, High-Speed Compressor Technologies”, in Proceedings of the International Compressor Engineering Conference, Purdue University, paper 1358, pp. 913-918, 1996. Lugt, P.M., Morales-Espejel, G.E., “A Review of Elasto-Hydrodynamic Lubrication Theory”, Tribology Transactions, 54, pp. 470-496, 2011. Jacobson, B.O., Morales-Espejel, G.E., “High Pressure Investigation of Refrigerants HFC245fa, R134a and R123”, in Proceedings of the International Compressor Engineering Conference, Purdue University, paper 1789, pp. 1-8, 2006. Laesecke A., Bair S. “High-pressure viscosity measurements of 1,1,1,2-tetrafluoroethane”. Int. J. Thermophysics, 32, pp. 925–941, 2011. Vergne, P., Fillot, N., Bouscharain, N., Devaux, N., Morales-Espejel, G.E., “An Experimental and Modeling Assessment of the HCFC-R123 Refrigerant Capabilities for Lubricating Rolling EHD Circular Contacts”, Proc IMechE, Part J, J. of Eng. Tribology, vol. 229(8), pp. 950-961, 2015. Morales-Espejel, G.E., Meeuwenoord, R., Félix Quiñonez, A., Hauleitner, R., “Film Thickness and Traction Measurements of Refrigerant R1233zd Used as Lubricant in Elastohydrodynamic Conditions”, Proc IMechE, Part C, J. of Eng. Tribology, vol. 229(2), pp. 244-253, 2014. Brizmer, V., Gabelli, A., Vieillard, C., Morales-Espejel, G.E., “An Experimental and Theoretical Study of Hybrid Bearing Micropitting Performance under Reduced Lubrication”, Tribology Transactions, 58, pp. 829-835, 2015. Morales-Espejel, G.E., Gabelli, A., Vieillard, C. “Hybrid Bearings Lubricated with Pure Refrigerants”. In: SRM, Technical Screw Compressor Conference, Stockholm, 4–7 September, 2001.